We’re back… with another Posole recipe! We’ve discovered that having a newborn really cramps your keeping-up-with-a-food-blog style (shocking, no?) — but we’re back with our first recipe in 2011, a delicious Green Chicken Posole, from the book Sunday Soup: A Year’s Worth of Mouth-Watering, Easy-to-Make Recipes . 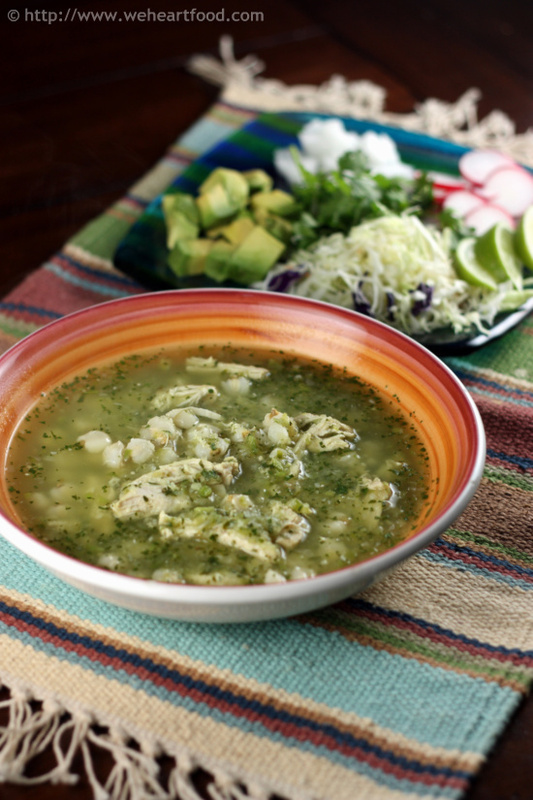 This posole is of the green variety, and the broth is chock-full of tomatillos, cilantro, and oregano. Yum! I know, I know… time..
Uh-oh, let’s get through this quick. Oooh, yeah — okay, well, you know I love posole, and this one might be one of my new favorites. Yeah, mine too! I love the tomatillo-broth base. It’s a bit spicy, but not overwhelming. Just right. Uhhh, can you grab a towel? And can we be done? Yeah, we’re done — hey, people, it’s easy and delicious! Bring the chicken stock to a boil in a large pot with a lid. Add the chicken breasts, cover, and simmer until cooked through, about 14 minutes. When done, remove the chicken, shred with two forks, and place aside. Measure out three cups of the cooking liquid and set aside. Remove the husks from the tomatillos, then rinse and chop. Add to a bowl along with the onion, cilantro, garlic, and jalapeño. In a food processor, add half this mixture, along with 1/2 cup of water, and puree until chunky. Do the same with the remaining half. Pour the tomatillo mixture into a dutch oven. Add the 3 cups of reserved cooking liquid, the shredded chicken, hominy, and oregano. Bring it to a simmer and cook until just heated through. Season with salt. Ladle into bowls and serve with garnishes!